The new touchscreen Chromebook undercuts the Pixel by $1000, AppsCare reports on Google's recent announcement. Google recently announced the new touchscreen Chromebook which undercuts the Chromebook Pixel by $1000. Finally, a touchscreen Chromebook for consumers as well as enterprise. Google Enterprise Premier Partner AppsCare provides more details. This new device will help more users experience the best of the tactile web for just $299. “As part of this immersive, tactile world, Acer has announced the new Acer C720P Chromebook with a multi-touch screen, adding the second touch-enabled Chromebook to the lineup. Acer’s Chromebooks are consistent best-sellers on Amazon, and this new device will help more users experience the best of the tactile web for just $299. Google isn’t a stranger to the touch craze with its touch-based Chromebook Pixel, but now its making its latest technology affordable for all. The new Chromebook sports a 11.6-inch touchscreen, a Haswell Intel CPU, 16GB solid state drive, 100GB of Google Drive Cloud Storage and a 30-day free trial to Google Play Music All Access. 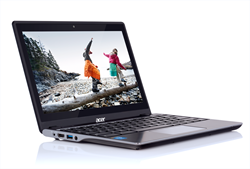 Like most Chromebooks, it also provides a whopping 7.5 hours of battery life. Learn more about Chromebooks for your organisation. Netpremacy was set up in 1998 to solve complex business problems using the most innovative technologies available. Today, over 2500 customers in over 30 countries around the globe utilise their services. Netpremacy provide fully Google and CCIE certified engineers in all fields, who build, maintain and secure some the most advanced global deployments. AppsCare®, Netpremacy’s Google Enterprise division provides explicit attention to detail on the back-end, which is complemented by their commitment to front-end users. A small number of their customers include: Advertising Standards Authority, Salvation Army, Institute of Chartered Accounts, Secom, KBC Bank, Lincoln City Council, Just Eat, and Conde Nast Publications.